If you do, God will direct your life. This is actually quite profound in itself. Fully trust God and submit to God and follow His directed leading. But who actually does this? Actually, given the rest of the chapter, the question we should be asking is Why would anyone not do this? As all of Proverbs include the wise words of Solomon, that first king of Israel given a wise and discerning heart directly by God as a gift (see 1 Kings 3:7-15), in Proverbs Chapter 3 we see a continuation of his plea to his own son for heartfelt obedience and adherence to his own wisdom teaching. In the verses just preceding everyone’s favorite verse, Solomon speaks of further beneficial impact, even prolonged life and peace and prosperity. In subsequent verses (Proverbs 3:5-20) Solomon highlights a simple and practical message that applies to all of us. Wisdom is trust in the Lord and our requisite guiding path to a life lived-well. This results from a fully submitted life to Him and Him alone. Wisdom that is humble, thankful, honoring of God and resistant to evil is healthy and bountiful in body and overflowing blessings in this life. Through the rest of the chapter Solomon continues in this same manner which would seem to border on practical advice mixed with poetic license. But be not deceived. The Bible is literature to be read and understood in the context of its literary style and delivery method. 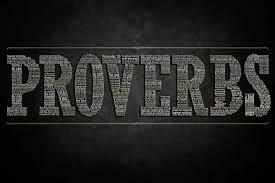 While a proverb is defined as “a pithy sentence, concisely expressing some well-established truth” these lessons from Solomon/Proverbs are non-trivial directives with the seal of divine inspiration. Recall that Solomon lived 700 years before the age of the wise Greek philosophers Socrates, Plato, and Aristotle. His sources are therefore not from the brightest minds of human history nor suspected from any surrounding heathen culture of his own time. His Proverbs are consistent with the sacred Psalms of David and the Hebrew Scriptures as deeply aligned with the God of Abraham, Jacob, and Moses. So wisdom with its requisite understanding, sound judgment and discretion actually preserves life in safety, without fear, in deep peace and rest. And wisdom does good, is good, upright, and blessed; very different from the perverse, wicked, ungodly, and cursed in comparison. The choice in life is relative clear: shame for proud mockers of God vs. God’s favor and inherited honor for the wise. Who wouldn’t want God’s wisdom?